Elrey35 I never thought that it would work as good as it did. Professional finish. Part of my ceiling needed to be redone after having some water damage and we never did replaced the popcorn texture and thus came handy n worked just fine. Willow3 This spray on texture is incredibly easy to use. Just prepare the area, cover the floor, and spray. It has great coverage, and it looks professional. I recieved a complimentary can to try, and I would absolutely buy it in the future. BethS We initially thought that we were going to use to do the ceiling in our small bath, we did and there was plenty left to fix a hole in the ceiling and coat it! This is product is amazing! Alot less work and mess to clean up and the finish is absolutely gorgeous! I would highly recommend this Popcorn ceiling texture to my family and friends!!! Jerryf New design allows for a somewhat more precise spray pattern than the old can. The product itself has never been an issue. The design of getting the spray to be more accurate it truly making this a product we will buy and use again. Jess This is a wonderful product. I've been wanting to fix the big nasty place in my ceiling for a while now, but dreaded it cause knew I would have to redo my entire ceiling. Showers that wasn't the case this item! Saved me soooooo much money, time, and aggervation. Very easy to use and clean up. Cannot tell where the repair was made. TimDDS I found this product did an excellent job, but as in many other repairs, technique is most important. After removing loose material from ceiling, paint area with a good stain block/primer. Brushing the paint from the center out onto edges minimizes the "step" or ledge created at the peripheries when the old plaster was removed. After the primer dries, shake the can vigorously for AT LEAST one minute. Then place the can into a sink filled with hot tap water to the level of the can's black plastic neck, for one minute. Then shake again for at least one minute ending with a downward motion. Holding can 16-20" away from ceiling, spray with a very rapid back and forth motion. Ending with material spraying just onto the old texture. Only a few seconds are needed in one small area in order to match the old texture. Remember, you can always add more if needed. Mike R Got this product to cover some areas where the popcorn ceiling had fallen. When it came time to cover the spot that was worked on this product worked as expected. It is a good idea to practice on the application technique before actually applying it to the area needed as it does require a bit of skill to try to mimic the current popcorn pattern on the ceiling. But once you feel comfortable with the technique then it works like a charm. NEW Homax Pro Grade™ Popcorn Ceiling Texture is the latest innovation in the Homax line of Pro Grade aerosol texture solutions for professional contractors. Advanced formula replicates commercial popcorn aggregates. 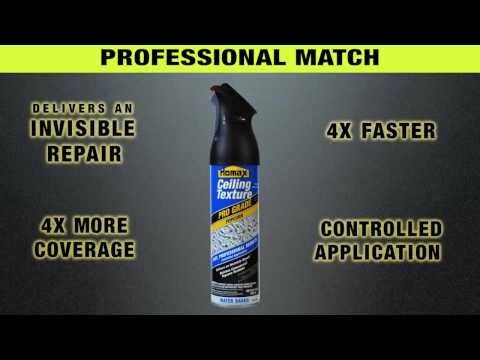 Delivers an Invisible Repair™ up to 4x faster than gun & hopper. Up to 4 times the coverage of traditional aerosols. Store and reuse. Better match and easier to feather. Less hassle, less mess, less time. 14 oz. Homax® Pro Grade™ Popcorn Ceiling Texture is the latest innovation in the Homax line of Pro Grade aerosol texture solutions for professional contractors. The advanced formula replicates commercial popcorn aggregates and delivers an Invisible Repair™ up to 4 times faster than traditional methods, with up to 4 times the coverage of traditional aerosols. The patented Pro Grade ergonomic grip is designed for comfort and enables more controlled application making it easier to feather into existing popcorn texture. The integrated safety lock enables the ability to store and reuse any remaining texture from job-to-job. Get professional results in the convenience of an aerosol. Homax® Pro Grade™ Popcorn Ceiling Texture provides a better match with less hassle, less mess and in less time than a traditional gun and hopper. Homax® Pro Grade™ Popcorn Ceiling Texture can be used for popcorn ceiling repair projects, fixture removal repair (lighting, sprinkler heads, smoke detectors, vents) or to complete punch lists and patches. Use in homes, apartments, commercial properties and more. DRY TIME: Painting is not required. If you choose, to paint allow Homax® Pro Grade™ Popcorn Ceiling Texture to dry 24 hours. Use a foam brush or roller to avoid damaging texture. PROTECT CARPET, FURNITURE AND WALLS FROM OVERSPRAY. DIRECTIONS FOR USE: MAKE ANY NECESSARY CEILING REPAIRS BEFORE APPLYING. PRIME/SEAL AREA WHITE BEFORE APPLYING TEXTURE. 1. SHAKE CAN vigorously for one full minute after you hear ball rattle in can and periodically during use. Ideally last shake motion should be downward to ensure material inside moves to bottom of can. 2. TO UNLOCK TRIGGER, turn RED safety lock counterclockwise. 3. SPRAY can UPRIGHT 20"- 30" away from ceiling and spray CONTINUOUSLY, sweeping across repair in a rapid, continuous motion and feathering texture into surrounding area. 4. AFTER USE AND TO STORE, turn can upside down and spray until texture is cleared. Return safety to locked position. Remove any texture build up from tip/nozzle. DRY TIME: Allow texture to dry 24 hours. TIPS: Painting is not required, but if desired to match surrounding area, apply lightly with paint brush or foam pad. For a finer chip size, hold can further away from ceiling and spray. For a coarser chip size, partially squeeze trigger, or hold can closer to ceiling when spraying. For a heavier texture application, apply first coat, allow to dry, then apply second coat to build texture as desired.